STUDENTS WORK ON LINKING WORDS(DESPITE,IN SPITE OF, DUE TO, BECAUSE OF, THANKS TO) IN FOUR ACTIVITIES OF MATCHING AND COMPLETING SENTENCES. I HOPE YOU´LL FIND THEM USEFUL! EXPRESSING PURPOSE BY MEANS OF INFINITIVE WITH TO, IN ORDER TO , SO AS TO. 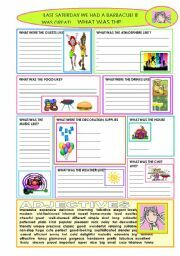 5 ACTIVITIES OF MATCHING WITH PICTURES, COMPLETING SENTENCES WITH SS´ OWN IDEAS, ANSWERING QUESTIONS. KEY INCLUDED. HOPE IT´S USEFUL! 3 pages. 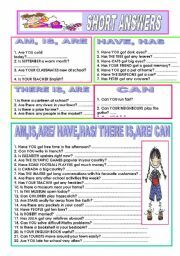 Page 1) Students revise short answers with be, have got, there is/are, can. Page 2+3) Students have to ask questions to the answers (verbs used: to be, have got, there is/are, can) Editable.Hope it´s useful! 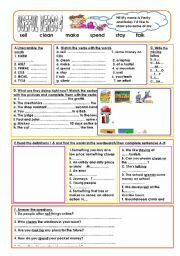 Fourth worksheet of a set of 11 wss where students revise some basic verbs. Different activities: unscrambling, matching, filling gaps, crossword, answering questions. Editable. Key included. THE PREVIEW IS QUITE MESSY (crossword and some pictures missing), BUT THE WORKSHEET IS OK AFTER DOWNLOADING. Hope it´s useful! Hugs. 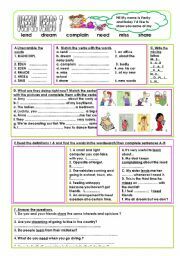 First worksheet of a set of 11 wss where students revise basic verbs. Different activities: unscrambling; matching; filling gaps; crossword; answering questions. Editable. Key included. Tenses used: present simple and present continuous. Hope it´s useful! PS: THE PREVIEW IS MESSY BUT WHEN YOU DOWNLOAD THE WS IT´S OK!! HUGS. 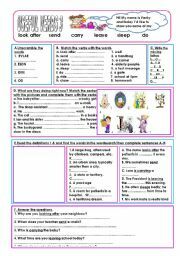 Ninth worksheet in a set of 11 wss where students revise basic verbs. 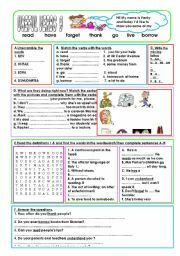 Different activities: unscrambling,matching, wordsearch, answering questions... Editable. Key included. The preview is messy but it should be ok after downloading. Hope it´s useful! Hugs. Seventh worksheet of a set of 11 wss. Students revise basic verbs. Different activities: unscrambling, filling gaps, matching; wordsearch, answering questions. Editable. Key included. The preview is messy but it should be ok after downloading it. Hope it´s useful! Hugs. REVISION OF WAS/WERE. STUDENTS WRITE ABOUT A BARBACUE (THE PEOPLE, THE FOOD, THE HOUSE, THE MUSIC, ETC.) EDITABLE. 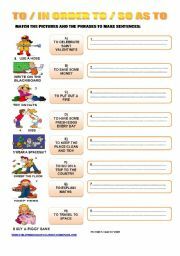 THERE´S A LIST OF ADJECTIVES TO BE USED IN THE ACTIVITY. HOPE IT´S USEFUL!